I ordered the parts via email on Sunday, 19th, had a confirmation email on Monday and paid via Paypal. They arrived today, Friday 24th at 1220!! Can't fault it, as the Welsh say. Everything was there and it all fits together,as to performance, that'll have to wait 'til I sort the rest out. Must be nice to have a functioning postal system! Just got some Enfield parts in the mail today (24 April) from India. Purchased 26 March, posted via air soon after. Arrived Vancouver, then took an additional 3+ weeks to get to our post office, less than 200 km (120 miles) away. This is normal. Even from a destination inside of Canada, takes 3 weeks or so. Rates are huge as well. It wasn't the French who had a hand in it, otherwise it would still be in Paris, it was UPS!!! The French parcel service is called Chronopost, should be Chronicpost, the idle sods won't drive the 18k up the mountain so they swear blind you weren't in and you must have lost the little post card they should have left, or they couldn't find it, despite the fact it's a huge white house with a B&B sign outside on the only main road to the col. Enough rant, I'll let some else get the thread back on topic! Good luck with the Enfield, I quite fancy one, there's a Brit round here with 7/8 of them ,he's bound to get bored with one sooner or later!! I've been doing some homework and some thinking -- A couple of worries I had is now busy getting sorted. 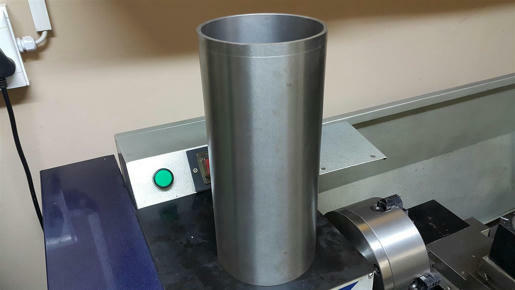 The engineering shop says they can machine the cylinder oversize to accept a sleeve. I suggested they shouldn't machine more than 3 a side out the bore, and they found a suitable sleeve in the catalog. I ordered the sleeve through a parts store and I was promised that will get the sleeve this coming Tuesday. The seized camshaft is another headache - Only the shaft and the bushes are damaged, but I can only get a complete camshaft. Nobody keeps stock of the shaft only. 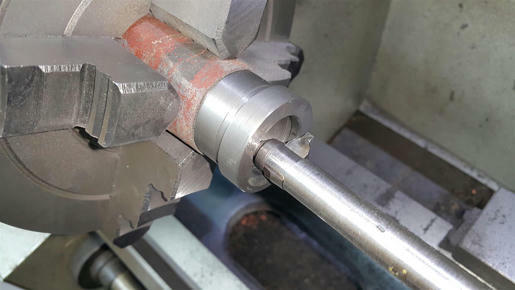 So I decided to machine the ends of the shaft and make new under-size bushes. I'll go see the engineering steel supplier next week and see if they can identify the cast bush material and supply that. I don't expect it to something weird other than some close grained cast iron. I wonder why this bush was not made of bronze like the other side? I recon IF the cast iron turns out to be a problem, then bronze might just do the trick. Maybe the end float bearing faces of a bronze bush will wear quicker than the cast iron? I received my invoice from Dev Precision, and I think I'll click the pay button. I'm getting a new gudgeon pin (wrist pin), new small end bush, new rings and new diesel pipes (Pump to injector and injector leak-off). $48 + $37 shipping = $85. Quickly turned a drift to take the camshaft's bronze bush out of the casing. It'll show it's real worth when it's time to drive the new bush in. I stripped the camshaft. See how the taper pin that holds the gear sheared off... Thank goodness for that! The pin that sheared saved all the other parts. I'll just put this aside for a while. I have more important things to sort out first. 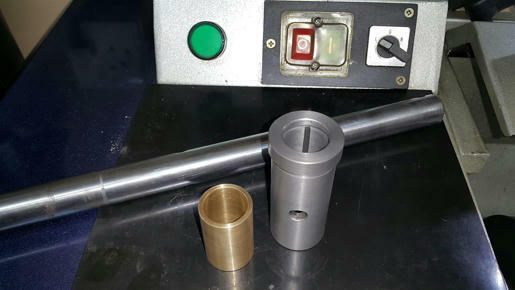 Shaft cleaned up 0.3mm under size at the one end, and a little more on the other end. Oh for a lathe and the knowledge of how to use it! The last photo with the broken cast cam bushing: looks like the missing part of it may be a match to the bit I found in my crankcase sump. Must have ended up there long ago, as an intact, complete bushing is there now! Thanks for the photos, keep us in the loop. Very nice machining work. Looks like a Asian made lathe . Is that a brazed carbide tool you are using ? I've never had any luck with those brazed tools for some reason . I made a new camshaft bush for my roid , I used a chunk of cast iron I had here . 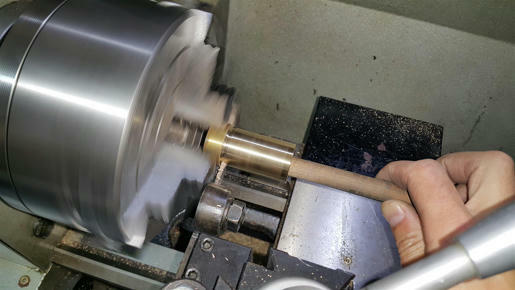 Yes, the lathe has become a tool I can't live without. I can't tell you how many times I start'er up to turn problems into shavings. That broken piece of bushing I made using a drift on the camshaft with a very big hammer in my right hand... that bush was seized SOLID on the shaft. Notice how the broken piece has a chunk missing on the one side: I had to break it to get it off the shaft. 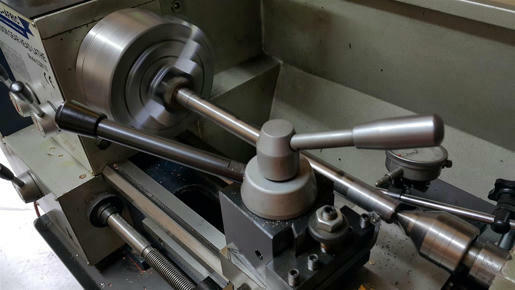 I have no idea where the lathe is made. It is sold under the name "Mac-Afric" by a tool company in South Africa. They import a whole range of equipment from all over under their brand name. Brazed tools are a bit "yesterday's technology". The trick is all in the sharpening technique to make them work. I also use HSS tools for special jobs. They are even more outdated in comparison, but you'll see how nice they work when I make the grooving tools for the bush ID. For someone who has not been taught to grind tooling, rather steer away and invest in disposable tip tools. I believe the brass bush is actually oilite, and the other end is cast iron. 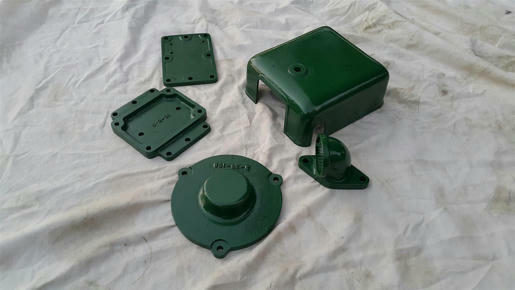 I got the cast iron, but the oilite bush I will replace with brass. 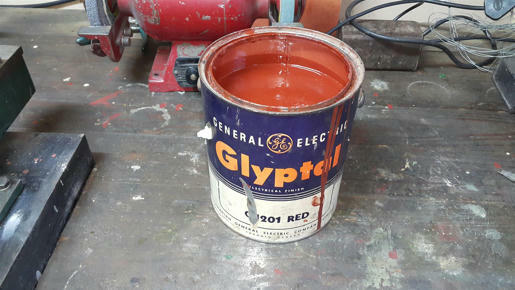 I think there is enough lubrication for the brass to work just fine. Hi Guys. Some updates again. I've done some painting of loose parts. Just for interest sake, I've approached this restoration a little different. Usually one would strip the whole engine down to a million pieces, and then start withe the cleaning and repair process. Because I knew from the start that it was going to be a long term project, I decided to strip, repair and store the parts as I remove them. I'm aiming for a nice finish so the tappet cover is going back to the body shop... The rotary wire brush left some marks in the aluminium and it's showing a little through the paint. Been busy behind the lathe for the most of today. Here I have the brass bush roughed out and cooled down. 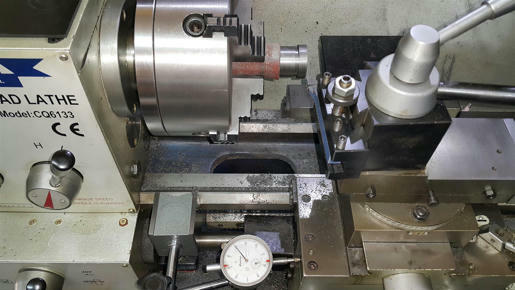 Best practice is to loosen the jaws and then reset the job using minimal pressure before final machining. 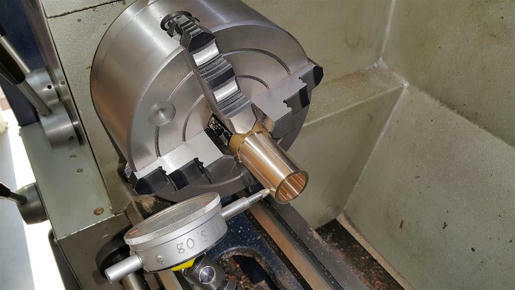 This will prevent the final machined bush from being out-of-round. 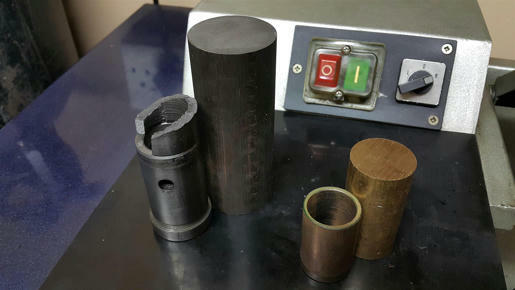 I've machined bronze bushings up to 1.5m diameter to within 0.05 tolerance. They do go out of round afterwards, but as long as the wall thickness is uniform, the bush will go round again when installed. Diameters final machined. Parting off and catching the bush with a dowel stick. The start of the cast iron bush. 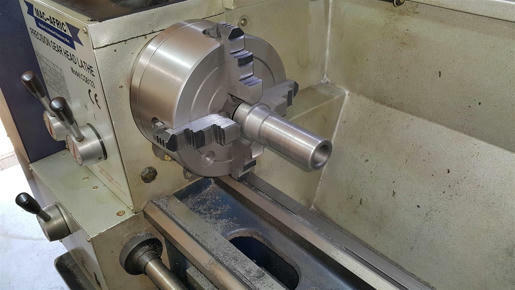 Last operation: Final machining the flange of the cast iron bush. 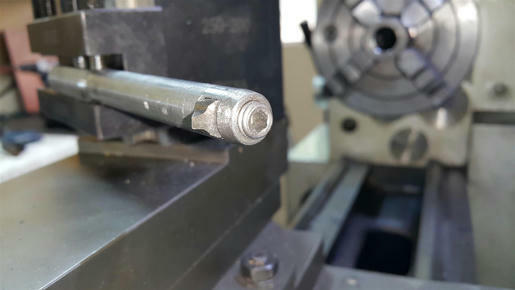 The thickness of the flange determines the camshaft end-float. 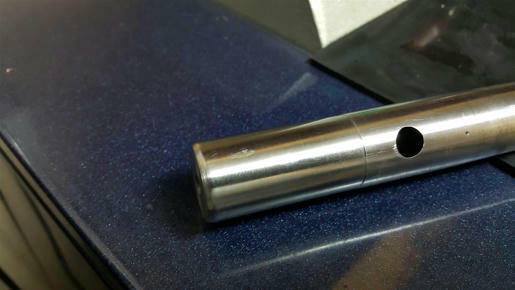 Special grooving tool I made from High Speed Steel. 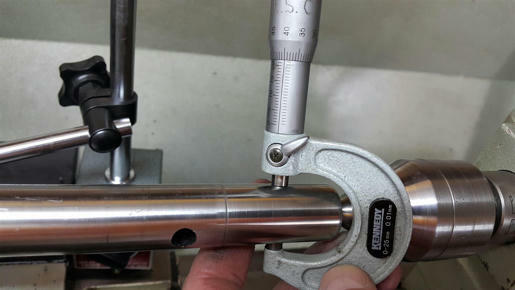 Same tool turned 90 degrees to slot the longitudinal oil groove. Very nice! You do good work. Sure is nice to have the right tools for the job isn't it? Homesteading it's not adventure it's life! Passive lubricating oil distribution guaranteed this way. Thanks for the compliment and the info. I like the idea of putting the grooves in the bush. So according to what I can see in the pictures, there is one radial groove down the middle of the bush, and just one axial groove that connects to it? What would be the correct orientation be to install the brass bush in the cover? 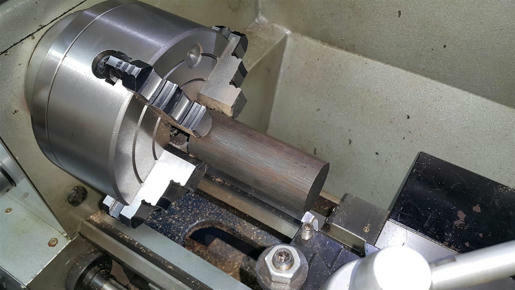 The cast iron bush has the oil hole in the 12 O'clock position, and the axial groove at 6 O'clock - the axial groove is relatively narrow, so not much bearing surface area is lost. The groove in your brass bush seems quite wide: There will be varying radial forces during most of the shaft's rotation as the followers ramp up and down the cams, but I would think that the brass bush must have the axial groove pointing to 12 O'clock as the bush will probably see the most pressure at 6 O'clock as the cams act against the fully compressed valve springs? ....Unless it was designed to collect oil at the bottom and outer journal (without a groove) being big enough to carry the load?